Making decorations for an Academy Awards party adds personal flare to the most anticipated awards ceremony in Hollywood. Research the current year’s Oscar hopefuls or previous nominees or for decorating inspiration. As you plan your party, remember that the ceremony is merely the first portion of Oscar night -- Oscar after-parties such as the Governor’s Ball are big events as well. Host your own version by supplying appetizers and a variety of cocktails after the televised ceremony is complete. Go to your local craft and party supply stores to purchase cutlery and flatware. Many party supply stores sell replicas of the Oscar statue as the date of the ceremony approaches. Look at party supply outlets online if you are unable to find trophies in your area. Purchase several red, rectangular plastic tablecloths to serve as your red carpet. Print out photos of famous actors, actresses and directors who have won an Oscar at previous Academy Awards ceremonies. Use red construction paper to frame the pictures, leaving a one-inch border of construction paper around the photos. Attach the photos to the construction paper with tape. Browse local second-hand stores for vintage movie posters. Local movie rental shops may also provide movie posters. Cut out pictures of movie stars at red carpet events. Tabloids and celebrity-themed magazines regularly feature paparazzi photos of stars attending red carpet premieres. Tape the pictures to a poster board. Make a red carpet leading to your front door with the red plastic tablecloths. Tape the tablecloths with industrial tape and smooth out any bubbles as you tape down the carpet. Hang your poster board of paparazzi photos outside your door with tape. Over the door, place a sign welcoming your guests to the Academy Awards. Tape your framed pictures of previous Oscar winners around your home, in the kitchen, living room and bathroom. Group pictures together in odd numbers for a modern look. Hang movie posters on the walls. Replace the art you usually display by inserting the movie posters in the picture frame, or simply attach posters with tape or poster tack. Set your table with cutlery and flatware. Sprinkle confetti in the center of the table. Place Oscar trophies in the center. Set Oscar trophies in different locations around the party. Place one by the door, on the television, by the food and any other prominent spot at your party. Red welcome mats work as a red carpet substitute if you are hosting a party in an apartment. 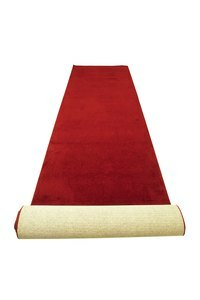 Make sure your red carpet is smooth and firmly taped to the ground to ensure your guests do not trip on the plastic.